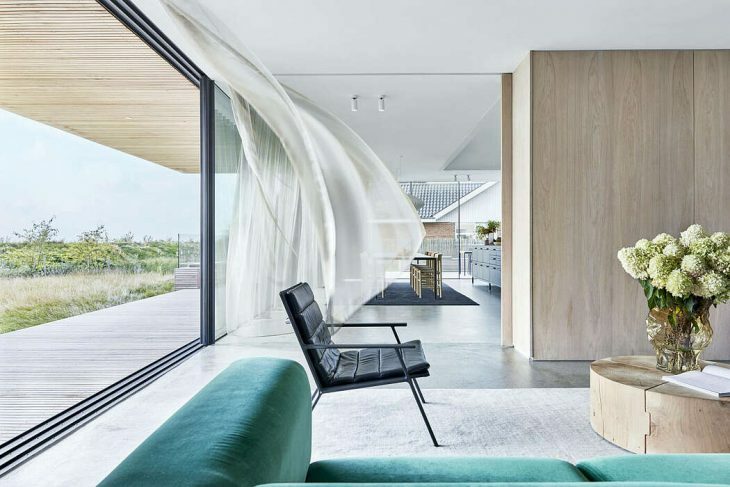 Studio David Thulstrup designed this inspiring beach house for a family of five, located just 15 minutes away from the center of Copenhagen, Denmark , in 2016. Take a look at the complete story after the jump. From the architects: In late 2015, Heidi and Kasper Egelund bought a piece of land in the neighbourhood of Søvang, a part of the Danish city Dragør. But don’t let the quiet and leafy location of Søvang fool you; the property is conveniently located only a 15-minute drive away from the center of Copenhagen. 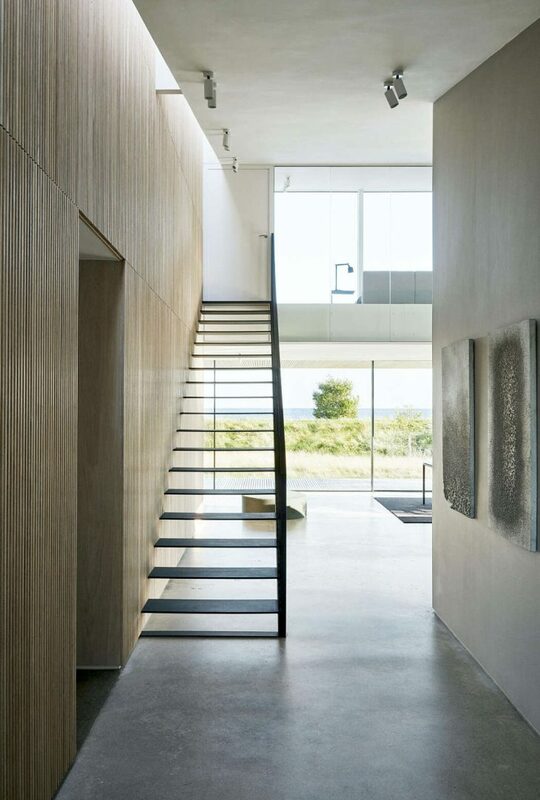 On this seaside plot, they decided to build a bespoke beach house home for their family of five. 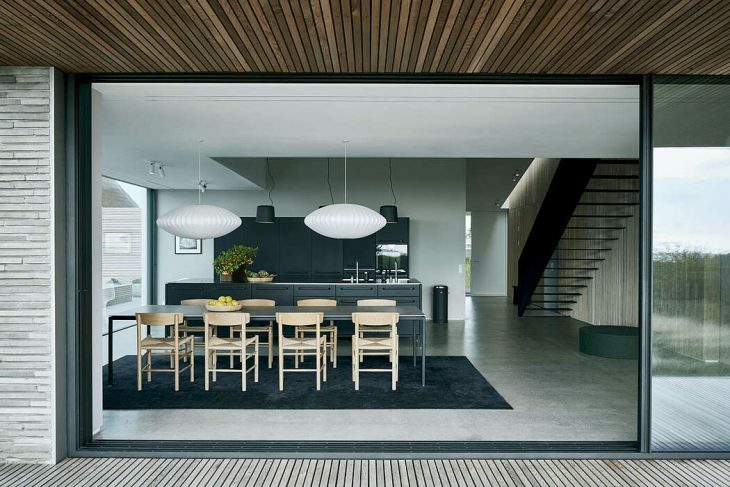 The couple, who are both a part of the Danish family-run design firm, Vipp, turned to architect Mads Lund with a wish to create a family home centered around refined aesthetics and functional choices paired with the experience of nature while being indoors. Architect Mads Lund envisioned a structure, which would keep the surrounding nature in full focus, excluding decorative elements that would pull attention away from the villa’s natural context. After pulling the right permits and one year of construction the family moved into a contemporary interpretation of a classic Danish villa yet with an architectural stamp that makes this home one-of-a-kind. Meet the family Kasper Egelund’s interest in functional design is not inherited from strangers. He is 3rd generation owner of the Danish design firm, Vipp, mostly known for his grandfather’s legendary pedal bin made in 1939 for his grandmother’s hairdressing salon. When his grandparents died, both Kasper’s mother, sister and himself took over the company with the wish to make Vipp accessible to design enthusiasts worldwide. Building something from scratch is what drives Kasper. Indeed, building your own home on an empty piece of land was a dream project for both Kasper and Heidi. And Vipp remains a family affair. With a background in marketing and sales, Heidi also spends her day at the Vipp HQ in Copenhagen. In fact, Kasper and Heidi launched the US branch of Vipp in 2008 with a showroom in Manhattan. But after 3 years, one baby and one more on the way, the couple returned to Denmark and settled in a town house 2 km from their new home. The result is an interplay between a classic sloping roof and a modernistic stabling of volumes; “we consider the house as a contemporary paraphrase to the classic villa tradition but also as a product of the Nordic tradition of functionality where every choice takes it point of departure in function,” explains architect Mads Lund, who got pretty much free hands in developing his vision of the house. The proximity to nature plays a defining role in the result. The dyke where dogs and families are breathing in the fresh air required a shielding while maintaining the view to the sea; hence the closed balustrade on the first floor. Likewise, the house has been elevated to ensure view to the sea and not the dyke from the kitchen. Responding to the natural scenery, the architect used a restricted material palette, inspired by the surrounding nature. Still, there are material contrasts between the layers of the house, each element holding its own characteristics yet cannot be separated from its family members. The base of the house is cladded with Columbia tiles from Pedersen, while the projected first floor is constructed with lists in cedar tree. Aluminium panels are used on the garage and the facade facing the sea. Tiles, wood and steel work as complimenting materials that together with the streamlined Panoramah sliding windows add a necessary simplicity to a house in movement. 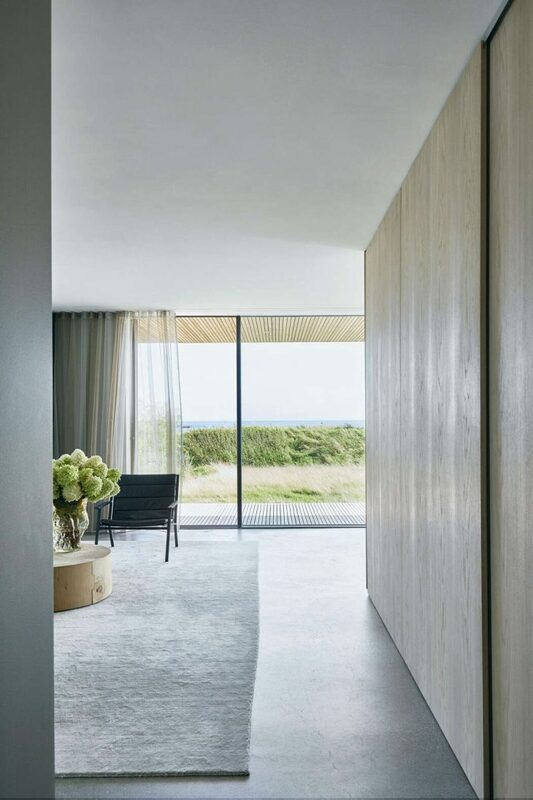 The architectural simplicity carries through to the interior design envisioned by Studio David Thulstrup. 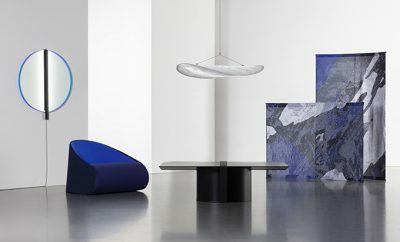 He has emphasized well-crafted details with colours that refer to nature, placing the strong contrasts of the black-coloured Vipp products into the center of attention. 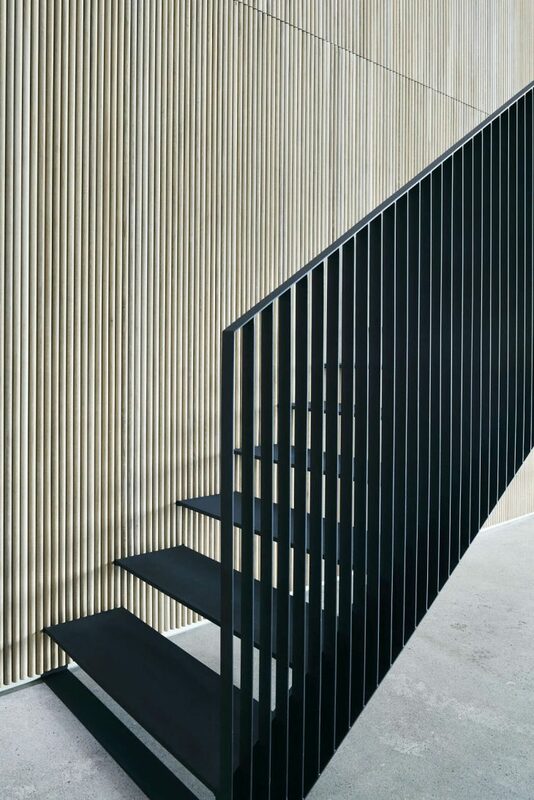 “The black metal staircase is inspired by the fundamental Vipp design language and stands light yet stringent in a contrast to the adjacent wood-cladded wall”, explains David Thulstrup. The wood cladded wall draws the viewers’ attention upwards, where the light influx from the second floor creates a play of light and shadows on the semi-cylindrical wood cladding, offering warmth and texture that contrasts the raw concrete flooring. The first thing you see when you enter the front door is an unobstructed view straight through to the bay. “With this view, you’re in constant conversation with the outside. I’ve always wanted to live in a glass house. When I was a design and communication student in Copenhagen, I fell in love with the Farnsworth House”, says Kasper, whose dream came through with a home that blurs boundaries between indoor and out. The next thing you notice is the custom black sculptural staircase in steel connecting a vast open plan kitchen and dining area with first floor’s master bed- and bathroom. From the main double height living space the home opens up into three almost identical children’s rooms and a living room that feel separate, but are visually connected to the rest of the house. 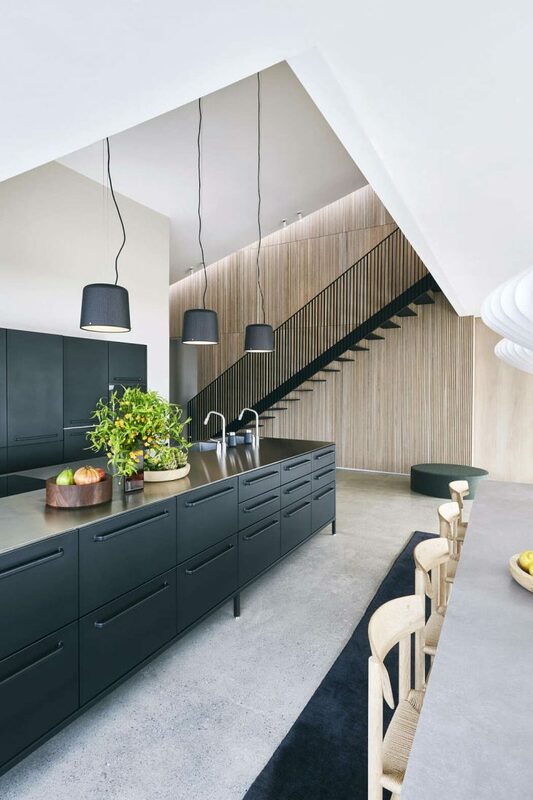 The 260 m2 family home revolves around a double-height central space dominated by the black kitchen island lit up by three low hanging Vipp pendants “It’s very minimal but we love the clean lines and robust nature. The central kitchen island from Vipp matches the array of tall cabinets in design and material. Firm grips, a matte black powder-coated surface and a table top in 4 mm stainless steel are ideal features in a kitchen that must accustom to a heavy dose of daily wear and tear”, says Heidi with reference to their three children all under the age of ten. 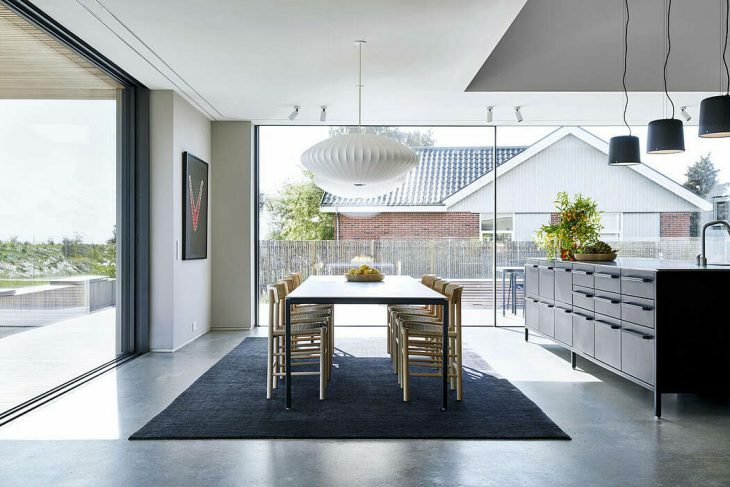 A large Vipp dining table encircled by Børge Mogensen dining chairs and lit up by Bubble lamps by George Nelson accommodates the big family. Glazing opens the kitchen up to the dining terrace, expanding the space naturally during the summer months. A wooden sun deck provides access into a grand garden on the 2300 m2 plot. Here, landscape architect, Pia Ingemann Øigaard, has added green beds of flowers and trees on a vast lawn to provide both perspective and ideal spots for a game of hide and seek. Living room A large ground-floor living room provides plenty of space for family time. 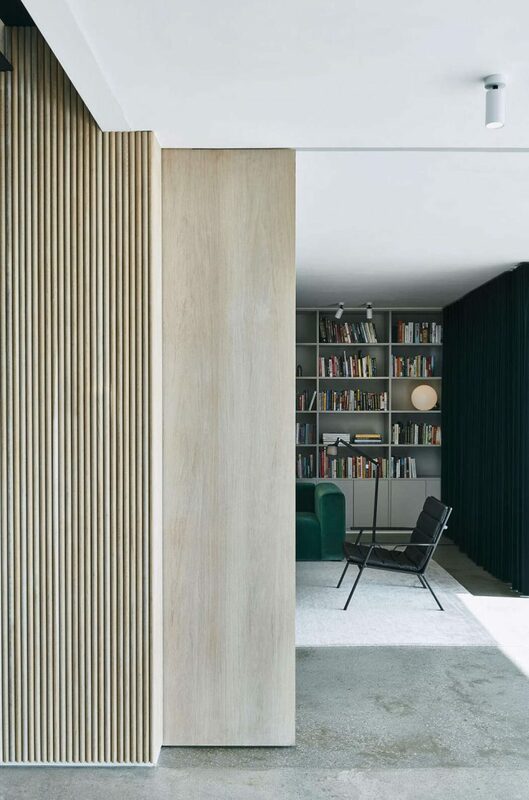 Hints of colours in upholstery and curtains add a home feeling and warmth to the space, while a vast bespoke bookcase bear witness to the family’s fondness of books. Many hours of Danish ‘hygge’ is spent in the green velvet sofa from Hay and the leather-upholstered lounge chair from Vipp. The ground and upper floor are conceived as two rectangular volumes, stacked on top of one another. The property’s top floor houses the master bedroom openly connected to a generous bathroom with access to a large balcony. From here, the owners can look down on Denmark’s longest bathing jetty of 279 m frequently used throughout the year by Heidi. 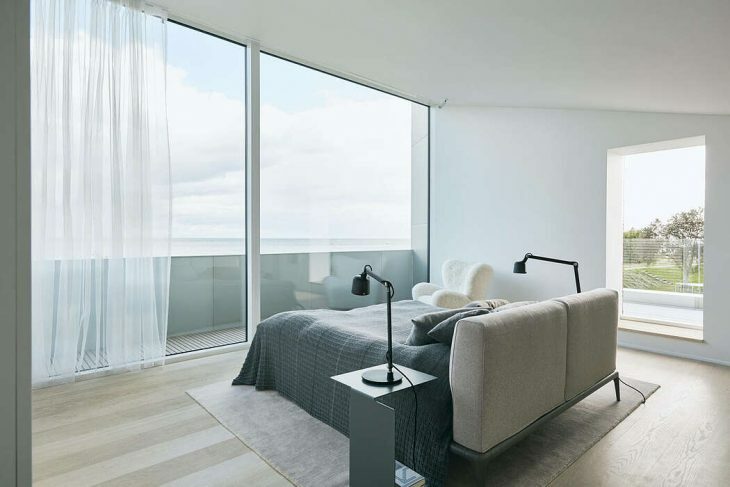 The center-staged bed from Poliform faces a window wall that offers a spectacular panorama view to the Baltic sea and its changing tides. A south-faced sun-deck is accessible from the bedroom. The all-white bathroom features a 3-unit module from Vipp mounted on textured, hexagonal-shaped Mutina tiles which enhance and play with light from the skylights above the bathtub from Copenhagen Bath.